The following article by Michelle Bruch was published on April 21, 2014 in the Southwest Journal. PARK WATCH NOTE: This article is being posted on Park Watch because the proposed Greystar project is across the street from Lake Calhoun and, therefore, is subject to the Shoreland Height Ordinance, which at this site allows building height up to 60 feet. Structures located on lake shore property elsewhere are limited to two and one-half stories or 35 feet. Because the Greystar developer wants to go even higher, it becomes a park related issue. Co-founder of Park Watch and former Board Member of ELECT (Emergency Lakes Environmental Coalition Task Force). Greenway view looking west with Calhoun Beach Club Apartments in background. 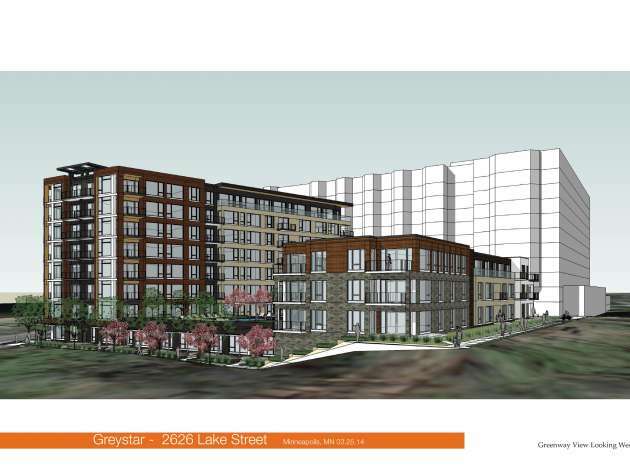 Greystar cleared neighborhood review in Cedar-Isles-Dean this month, planning high-end apartments at 2622 W. Lake that would rise four stories lower than the neighboring Calhoun Beach Club Apartments. The eight-story and three-story structures would sit on piles three feet above the water table. ESG Architects Principal David Graham said the project would not need to pump any groundwater from the site. Average rents for the “rental condominiums” would be $4,500 per month, although a larger 4,000-square-foot unit skews the average a bit. The apartments would charge $2.30-$2.60 per square foot, with an average unit size of 1,600 square feet. “What’s a rental condominium?” one meeting attendee asked. Graham said the apartments would be built as though they were condos, with 10-foot ceilings, ample storage and large units. David Reid, Greystar’s senior managing director of development, said he’s found that a segment of the rental market is quickly filling up the largest units in other Greystar projects, and they look for high-quality construction. The project would feature a 30-foot landscaped boulevard and would preserve a line of Cottonwood trees. The architect projected no adversarial effects in terms of wind currents on Lake Calhoun. Residents in the area countered that the northwest corner of the lake is already “very iffy for sailing,” however. Other residents pressed for a safe cone of vision for traffic entering Lake Street on Thomas, as they said a fence there today limits drivers’ lines of sight. The developer has not completed a traffic study. Graham said he thinks the 90-unit project would have limited impact on the area’s heavy traffic. “This will add some increment, but it is negligible,” he said. Cedar-Isles-Dean Neighborhood Association (CIDNA) members said they are interested in collaborating with the developer, Park Board and other entities to consider a new pedestrian and bike trail through the area. It could run along Thomas Avenue, through the north end of the site and adjacent parkland, and under the Midtown Greenway to reach Lake of the Isles between the dog park and soccer field. “[Thomas is] relatively safe in terms of a place to cross,” Graham said. She reminded CIDNA of an original 24-story proposal next to the Calhoun Beach Club dating back to 1987. Citizens sued the city to protect the lakes, she said, and shortly afterward, the city passed the Shoreland Ordinance limiting development around the lakes to 35 feet (two-and-a-half stories). She said that residents were able to pressure the city into action at the time because it was out of compliance with state law. Graham said the Shoreland height limits are “not absolute law,” as the city can issue conditional use permits to allow projects to rise above those limits. CIDNA Land Use Chair Bob Corrick said the law is still useful, however. In the end, the developer agreed to build in accordance with “all applicable laws,” inserted as a condition of CIDNA’s recommendation. CIDNA members agreed that this is the last undeveloped site along Lake Calhoun. “Amen after 10 years of working on this,” Corrick said. This entry was posted in Uncategorized on April 26, 2014 by citoyen1789.